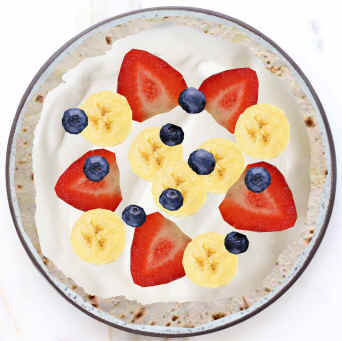 What you need: Flour tortillas, yogurt (strawberry or red raspberry), shredded coconut-sweetened, various fruit such as sliced bananas, strawberries, blueberries, etc. What you do: Spread the yogurt onto the tortillas. Sprinkle the shredded coconut over the yogurt. Arrange the fruit on top. Slice your Fruit of the Spirit Pizza into nine sections (to represent the nine aspects of the Fruit of the Spirit). Eat and enjoy! Allow this sweet and flavorful dessert to remind you to follow Jesus, then you will be able to bring the sweet and flavorful Fruit of the Spirit to your family, friends, and coworkers each day! 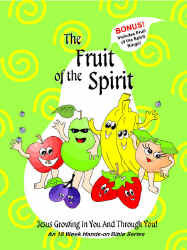 This is just one of the activities you'll find in, The Fruit of the Spirit Bible lessons -- for K-5th grade.